For today at least, Sin City is not a scorching hellhole. 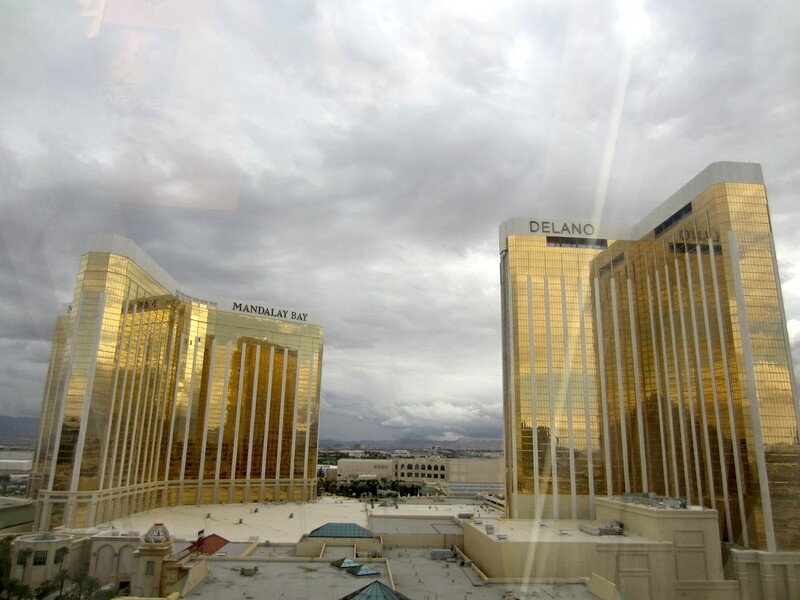 LAS VEGAS, Nevada (MDM) — Early rising makes me disagreeable, even more so than usual. So rather than make my usual pilgrimage to Late for the Train, I fled Flagstaff for Vegas, where one more bad attitude is the equivalent of a mouse fart at a sewage treatment plant. Oddly, my arrival was completely incident-free. I checked in at the Luxor, picked up my show badge, and settled into my spacious Cycling Journalist’s Suite at the Luxor, awaiting the first of what I hope will be many meals at someone else’s expense. The kickoff is always dinner with the Bicycle Retailer and Industry News mob. Then Adventure Cyclist takes a pounding for the duration. That’s Smirnoff, but not of the Yakov variety. Throwing a few meaty bones to the old Dog is a small price to pay to keep me out of the office, and indeed across state lines. More than one of them, too, BRAIN being a California concern while Adventure Cyclist is based up Montana way. 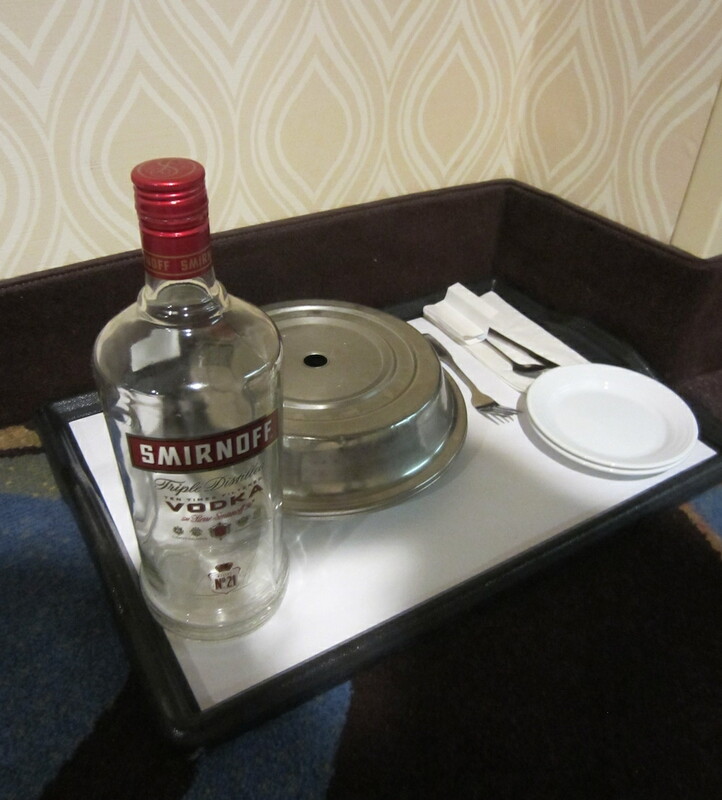 On the way over to score my badge I noticed that someone had already had his dinner. Well, like they say, what happens in Vegas stays in Vegas. Specifically, in and around the toilet at the Luxor. 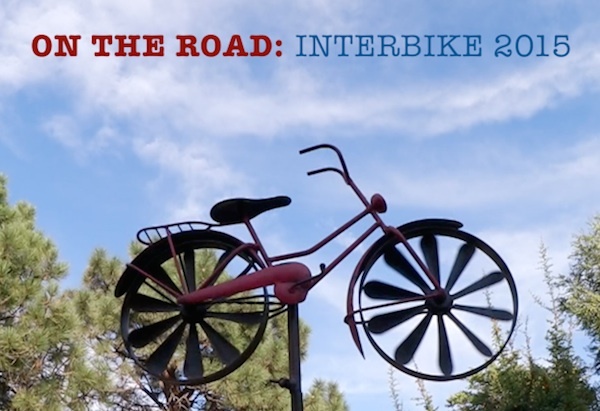 This entry was posted on September 15, 2015 at 5:46 pm and is filed under Adventure Cyclist, Bicycle Retailer and Industry News, Bike stuff, Food, Interbike. You can follow any responses to this entry through the RSS 2.0 feed. You can leave a response, or trackback from your own site. Obviously not a high roller in the vodka department. No Absolut or Titos for that pedestrian. I’m amazed they let those people stay in the same place as a Mad Dog. No class, no class at all. Stay classy Senor Dog, and send us pictures of sweet bicycle eye candy. And Larry too, if you can find the bum. My worst experience with cheap booze resulted in the co-eds on the floor beneath my dorm room being blessed with whatever I had for lunch and dinner that day being deposited on their window sill. Yech….